Eva Mills, right, and Holden Grzywacz, two survivors of the Las Vegas mass shooting, mourn the death of Sean Adler during a vigil at the Rivalry Roasters coffee shop Thursday, Nov. 8, 2018, in Simi Valley, California. It was college night at a country-music bar in the third-safest city in America. Inside, people were line dancing. Outside, a man in black clothing approached the door. In the next few minutes, the gunman — identified by police as 28-year-old Ian David Long — killed 11 other people in the Borderline Bar & Grill, including a sheriff’s sergeant who rushed in to stop him. At least one survivor of the Las Vegas shooting was in the bar Wednesday – again trying to enjoy country music while on a night out – his second mass shooting in 13 months. Police said they weren’t sure why the gunman, who lived in nearby Newbury Park, California, was drawn to the bar. A former roommate said Long was quiet and prone to unusual behavior – like dancing alone in his garage to “trance” music, a kind of electronic dance music. In recent years, police said they had “several contacts” with Long, mostly for minor events including traffic accidents. In April, deputies were called to the home Long shared with his mother for a reported disturbance, Dean said. Neighbors described that incident as looking like a standoff, with police cars blocking the street and officers taking cover with rifles. 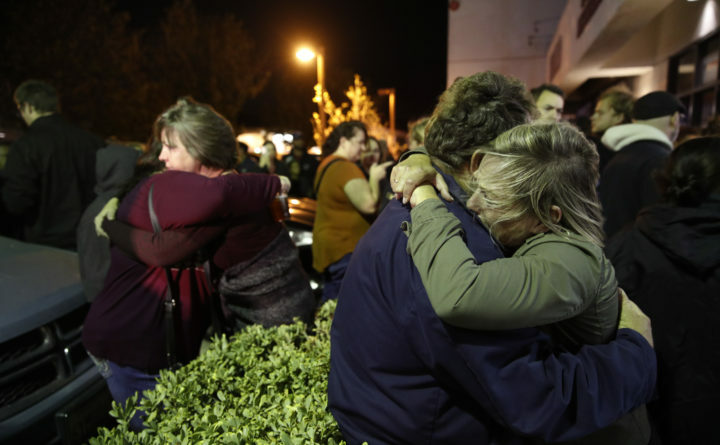 On Wednesday evening, there were at least 100 people inside the Borderline bar – which describes itself as Ventura County’s largest country dance hall and live music venue. The city of 130,000, northwest of Los Angeles, was ranked “third safest,” based on FBI crime data. Many of the patrons were drawn by the “college country night” promotion. Six off-duty police officers from other agencies were inside, Dean said. It appeared they were there as patrons, not working paid security details. It was 11:20 p.m. Pacific time. Chris Brown’s “Turn Up the Music” was blaring on the dance floor. “I’m going in,” Helus said, according to the radio calls. Inside, the gunman shot Helus several times. The Washington Post’s Rob Kuznia and Tony Biasotti in Thousand Oaks, California, and Julie Tate, Alice Crites, Jennifer Jenkins, William Wan, Allyson Chiu, Antonia Noori Farzan, Meagan Flynn, Kyle Swenson, Fred Barbash, Alex Horton, Amar Nadir, Lindsey Bever, Isaac Stanley-Becker and Matt Zapotosky in Washington contributed to this report.